Microsoft says it is working to address a bug that had caused some Windows 10 applications to experience momentary "stuttering" performance problems. The flaws, reported to Microsoft by gamers who had installed the Creators Update, resulted in games stuttering and momentarily dropping frame rates. After months of waiting for a fix, users running the Insider Build have now been told by Microsoft that patches are in the pipeline. 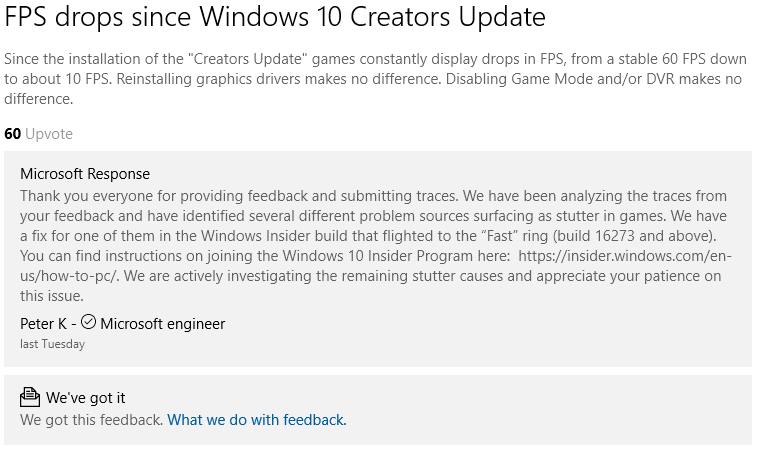 "Thank you everyone for providing feedback and submitting traces," Microsoft said via an alert posted to the Feedback Hub app on Windows 10. "We have been analyzing the traces from your feedback and have identified several different problem sources surfacing as stutter in games." For those not running the Insider test builds, the patches will arrive in October when the new Creators Update hits general availability. Whether the fixes will fully resolve the stuttering problems remains to be seen, though early feedback on the Windows 10 subreddit suggests that for at least some of the users, the updates have done the trick. Gamers in particular have been among the most stubborn holdouts for the older Windows 7 – in part over compatibility concerns but also because of performance worries. Getting the stuttering issue under control will only help Microsoft make the case to get everyone migrating to the Creators Update. The Fall Creators Update is being seen as a key release for Microsoft as it tries to sell PC users on its Windows as a Service approach both in the home and enterprise markets. A new Linux subsystem for developers.